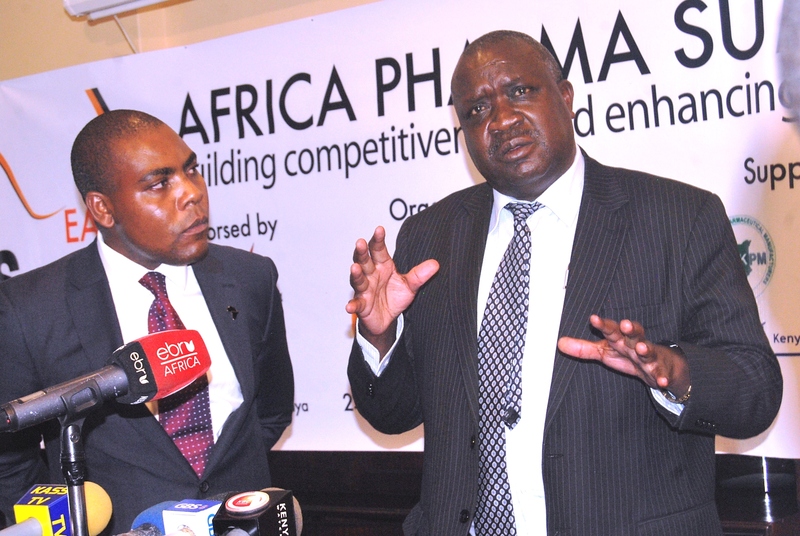 NAIROBI, Kenya — Amid concerns over cheap imports, substandard products and counterfeits, pharmaceutical experts in East Africa are set to hold a summit early next year to discuss key challenges facing the industry in the region. Experts at the 17 November event announcement in Nairobi stressed that technology transfer, better regulation and policy reforms can accelerate growth and spur innovation in the sector. The conference, dubbed the Africa Pharmaceutical Summit (APS) East 2016, is organised by PharmaAfrica Ltd, a company whose mission is to provide a platform to enable growth of quality in the industry. Kenya’s Ministry of Health and the Ministry of Industrialization and Enterprise Development will host the summit from 24-25 February 2016. The third in a series by PharmaAfrica Ltd will be held under the theme: Building competitiveness and enhancing markets. Africa bears the greatest disease burden globally, according to the experts, unfortunately, it depends on externally developed and procured medical drugs, vaccines, medical devices and diagnostics to meet its health needs. In addition to the emergence of non-communicable diseases driven by socioeconomic developments, the continent carries 75 percent of world’s HIV and AIDS cases, 90 percent of malaria deaths are in Africa and a huge tuberculosis burden. Still, only 30 percent of the pharmaceutical product are produced locally – about 70 percent are imported. In East Africa, the experts believe that a decade of economic growth in the region, where Kenya and Uganda economies are expected to drive a 6.8 percent growth in East African region, will boost the pharmaceutical industry. Currently, Kenya has 36 drug manufacturing factories, Uganda has six and Tanzania four. Market opportunities and accelerating regional integration will see factories rise, according to Koskei. However, he cautioned that regulation plays a key role in ensuring an environment of innovation and growth for the pharmaceutical industry. Dhirendra Shah, chairman, Federation of East African Pharmaceutical Manufacturers, while citing the East African Community (EAC) policy and strategy 2012-2013, said it was evident that the sector is a priority area for East African governments. Shah said the partners were keen to promote the sector through skills development and technology transfer. Combined with research and innovations, the two are seen as key to solving the region’s pharmaceutical sector challenges, the experts note. But for Shah, although practitioners have often stressed technology transfer, the industry abilities remain only at manufacture of basic drugs. “We need to give support so that the industry can manufacture drugs that are of international standards,” said Shah, the managing director Biodeal Laboratories Ltd., a Kenyan company. A sticking issue is the pricing of the pharmaceutical products, which the experts say they want tackled. A drug in Africa, for example, are is often overpriced, costing thousands times more than the cost in Asian countries like Indian, the meeting heard. “We need to start classifying the medicines according to the production capacities of local manufactures,” Shah said. “If a medicine is produced locally and the same product is also imported, the imported product should be taxed or even restricted from further importation,” suggested Shah. Another key problem has been the branding of the pharmaceutical products. Kamamia wa Murichu, chairperson, Kenya Pharmaceutical Distributors Association, thinks this should be stopped to make the products less expensive and affordable. “For drugs, I think the prescriptions should be generic,” said Murichu. Some of the stakeholders want the multinational pharmaceutical companies that operated in Kenya in the 1980s and 90s, but moved out over irregular power supply, to return to set up local industries. “The government is addressing the problem and power supply is now stable. I think it’s time they came back,” said Paul Mwaniki, the chairperson, Pharmaceutical Society of Kenya. According to Mwaniki, local manufacturing sector government procurement which remains at 15 percent should be increased to 50 percent. “With the policy of promoting local production, there is no reason why the government should bring containers of what can be produced here,” said Mwaniki. He said his organisation will be lobbying for a ban on the importation of pharmaceutical products which can be manufactured locally. Meanwhile, the United Nations Industrial Development Organization (UNIDO), which has been supporting the sector for the last five years, says there has been a lot of improvement and progress. “I can say for fact is that there has been a lot of improvement and progress in that sector. The whole industry is moving the standards,” said Wilberforce Wanyanga, a consultant with the UN body. Still, the official says supporting the regulatory functions and the industry in coming up, there should be competent industry that will not only seek protection, but also export around the world. On regulation, he said while the issue of counterfeits was minor, the impact is huge. Pharmaceutical experts here have been struggling with the definition of counterfeits, the meeting heard. Some of the experts said most drugs in the market often referred to as counterfeits are substandard drugs. Counterfeit typically refers to a trademark violation, not to the quality of the product. “So we look at the impacts and I think that should be controlled. One of the ways is to support the regulatory organs so that they can be able to identify counterfeits?,” said Wanyanga. Miles Mudzviti, founder and PharmaAfrica chief executive officer, said the summit will shape the conversation towards building competitive pharmaceutical industry that will help in expanding access to quality and affordable medicines. Major industry stakeholders, including leaders, policymakers, regulators, academics, investors, development organisations and financiers, scientists and patient’s representatives will attend the conference. “There is a clear momentum in Africa for the development of the pharmaceutical industry with emphasis on building capacity for local production through strategic partnership and technology transfer,” Kipkerich Koskei, Kenya government chief pharmacist, said at the meeting. “We hope the meeting will foster public-private dialogue to catalyse development within the pharmaceutical sector,” added the official, while expressing the government’s commitment to the summit. Fredrick Nzwili may be reached at info@ip-watch.ch. "Tech Transfer, Better Regulation, Policy Reform Can Spur Growth In East Africa’s Pharma Sector, Experts Say" by Intellectual Property Watch is licensed under a Creative Commons Attribution-NonCommercial-ShareAlike 4.0 International License. As a data engineer at the Gambia Company http://www.tilogeo.com creating software to identify problems in a heap of data in the medical or other domain is part and parcel of what we are able to do with our algorithms. Technology can go a long way in reducing counterfeit drugs through proper tracking of drugs from their creation to point of sale.